The New England Patriots are the number one seed for the playoffs! Sorry if the Pats aren’t your team, or your team is the number 2 seed or if your team didn’t even make the playoffs. It is a tough time of year for football fans, looking at the teams that did make it and wondering how the heck they did it! Which makes me think of the year the Pats won their first Superbowl. How did they even get to the playoffs with a quarterback fresh off the bench? Well I am glad they did and went right through to the Super Bowl. That year the Super Bowl was played in New Orleans and my husband and I were lucky enough to go. What an experience! The music on Bourbon St. The jambalaya, the beignets. I even tried turtle soup. All the spicy, Cajun food was tremendous! Then of course the whole Super Bowl experience on top of it. Crazy! Whenever I want to recall that feeling of New Orleans, I will make some creole gumbo. 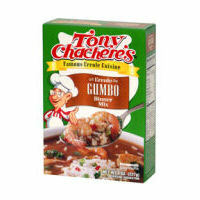 Tony Chachere’s Creole Gumbo Dinner Mix is one of my favorites. Tony Chachere’s has a whole line of New Orleans inspired dinners. So as I am not really familiar with traditional Indiana food, I think for this playoff season I will stick with the gumbo and jambalaya and think back to that great Pats Super Bowl win in New Orleans!